This is one of a selection of Motor Racing Posters I currently have available. 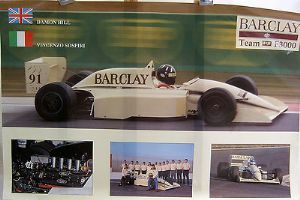 This one is of the Official Team Barclay EJR from the 1991 Formula 3000 Series. This poster shows the Lola T91/50 Cosworth driven by Damon Hill and Vincenzo Sospire. Each of the posters has been stored in a plastic sheath for security reasons and is, therefore, in excellent condition. The posters have not been pinned or stuck to a wall (or similar) so there are no pin marks or tears to the paper. They will be dispatched to UK customers in the artcare plastic display sheaths to keep them pristine. This poster measure 15.75 inches (40 cms) x 23.75 inches (63.5 cms).